Retail info is out for the first series of next year, 2017 Series 1 Garbage Pail Kids Adam-Geddon. For the most part Topps is following the same formula as they did with both 2016 sets. However, as with Hobby/Collector packs, Topps is making major changes to the number of cards in each pack. All regular retail packs found in retail boxes, gravity feeds, blasters, and blisters will now contain 8 cards per pack. 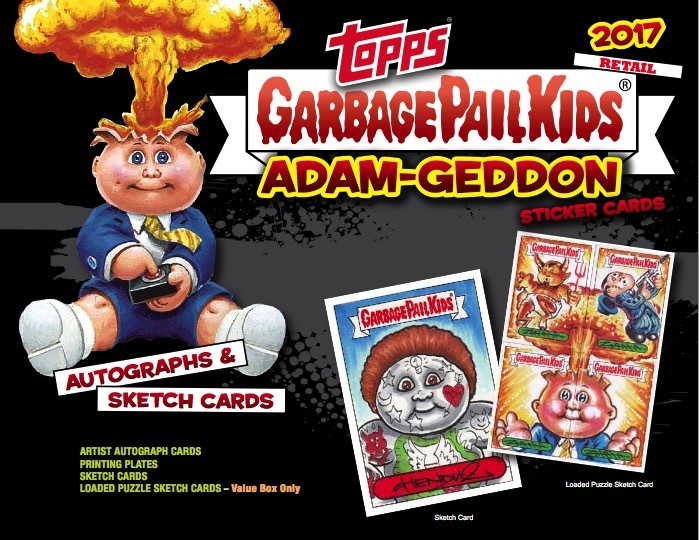 Each pack will come with 7 base cards and 1 Puke parallel card. Previously, retail packs have been coming with 10 cards per pack. No word yet on the manufacture’s suggested retail price from Topps on retail packs. Pre-order prices for Hobby/Collector boxes are lower than previous series. 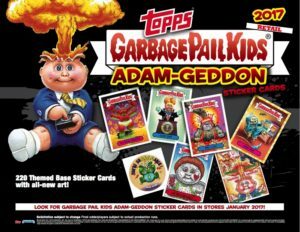 Blaster boxes are returning, but with one other big change Topps is making. Blasters will now come with 5 packs per box, compared to the previous 4 packs per box. Once again, Topps is making two types of Blasters, SE boxes will include 3 Gross Bears reprinted cards, while the EA boxes will contain 3 Bathroom Buddies reprinted cards. 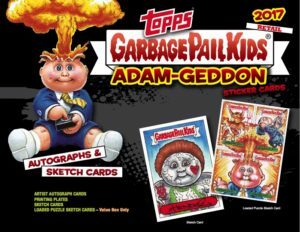 The popular Loaded Artist Sketches will also be randomly be inserted in Blaster boxes. Jumbo “Fat Packs” will also be offered at retail. Each Jumbo pack will contain 19 base cards and 3 Green Puke parallels. 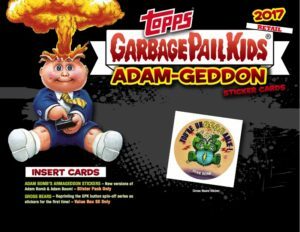 Also inserted will be two “Classic Adam-Geddon Stickers”. There is no mention of Panoramic Sketches on the sell sheet this time. In the 2016 sets the Panoramic Sketches were found inserted in the Jumbo packs. Blister packs previously sold at Toys r Us and Wal-Mart will also return. 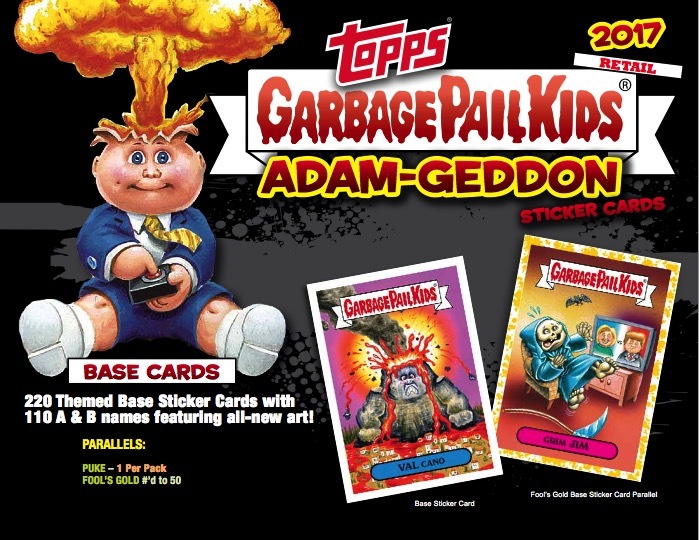 Each Blister will contain new versions of Adam Bomb/Boom called, “Adam Bomb’s Armageddon Stickers”. To view the Retail Sell Sheet in PDF, click here. Or check out the pictures below. 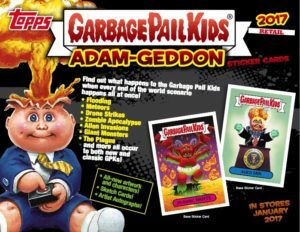 2017 Series 1 GPK Adam-Geddon is set to hit store shelves Jan. 18, 2017. 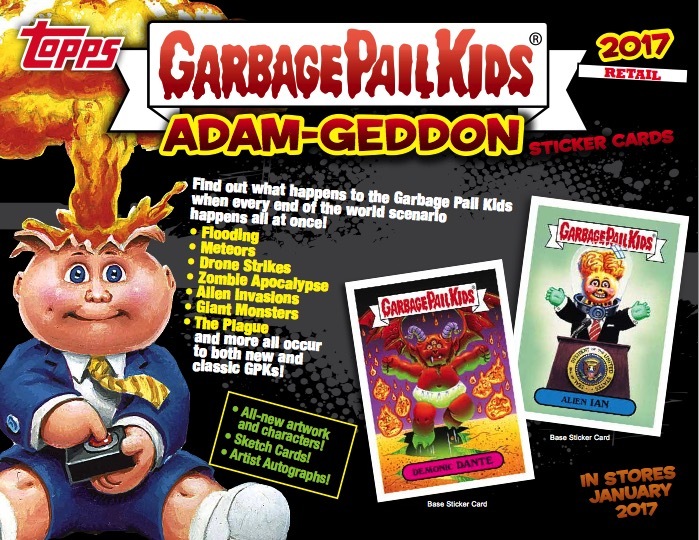 This entry was posted in 2017 Adamgeddon, Retail, Sell Sheet and tagged 2017 Adamgeddon, Retail, Sell Sheet by Jeff. Bookmark the permalink.